In the weeks after historian Thum Ping Tjin was questioned for six hours over his research into Operation Coldstore, there were some rumblings on social media that the Government had gone too far during the parliamentary committee hearing on fake news. Concerned, Dr Janil Puthucheary went down to the ground to ask people: Did they really feel that way? He recounts: "This is exactly what we did when we were receiving feedback on how everybody was so angry and worried about the Select Committee process and the six hours: We went to the grassroots, into the constituency, door to door - and nobody asked about it, nobody wanted to talk about it, nobody was the least bit concerned about it." It is one example of how there is sometimes "a disconnect" between a vocal segment of society and the average Singaporean, he says in an interview with The Straits Times last week. That does not mean he dismisses what he reads online, he stresses. "You need both. You have to understand what are the implications of feedback coming through the different channels," he says. 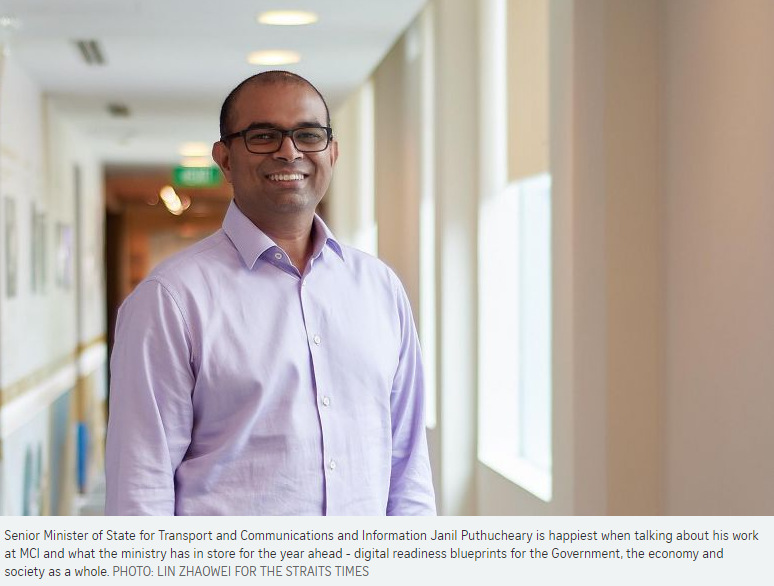 The increasing complexity of engaging with the public in an era of social media is an issue that is core to Dr Janil's work at the Ministry of Communications and Information (MCI). It is an area that the ministry has significantly stepped up on, in particular after the watershed 2011 General Election. The Government has since been seen to be more responsive to feedback, and this is dependent, in turn, on getting an accurate sensing on the ground. Dr Janil says the key is not to rely on any single channel or any single viewpoint. "You must have more than a triangulation, a multitude of inputs and a multitude of viewpoints. "And then go back out again and ask, 'Is this what you're really worried about? I'm told this is what you're really worried about.' "
The Government has also experimented with different ways of getting its messages across, from hiring social media influencers - sometimes to mixed reception - to producing drama serials such as Jiak Ba Buay? (Hokkien for "Eat Already?") and video advertisements. While there is much to be done in making sure such efforts are pulled off well, he says the effectiveness of government communication campaigns has improved over the years. "People remember them and talk to us about them. So I think the effectiveness of reaching out has certainly improved." Throughout the 1 ½-hour interview, the self-professed tech geek who joined politics in 2011 is happiest when talking about his work at MCI and what the ministry has in store for the year ahead - digital readiness blueprints for the Government, the economy and society as a whole. These will map out how Smart Nation initiatives and digital services "will be engaging and useful to Singaporeans from all walks of life". Much of the work will involve outreach, engagement and teaching Singaporeans how to use digital services and products to improve their lives, he adds. Dr Janil has also taken over responsibility for cyber security from retired communications and information minister Yaacob Ibrahim. The Cyber Security Agency is working with regulatory bodies to develop cyber security infrastructure and protocols that are relevant to each of them and will be interacting with foreign counterparts to co-develop international standards, he says. The 45-year-old was also appointed Senior Minister of State for Transport in the recent Cabinet reshuffle. The former paediatrician speaks fast - and evidently thinks fast. Ask if he is concerned about being in a ministry that has taken a lot of heat from the public, and he replies with equanimity: "I think it is reasonable for the public to have expectations of us and it is reasonable for us to try to jolly well live up to those expectations." Another major focus on his agenda this year is the issue of online falsehoods. Dr Janil is part of a rarely established Select Committee set up to ponder over how Singapore should respond to proliferating fake news. It conducted extensive public hearings in March and will reconvene this month to deliberate on a report of its findings to Parliament. Any government effort to address the matter has to be done in concert with technology and media companies and even the public at large, he says. Even then, he believes the problem of such falsehoods may never be solved: "It is just an ongoing work to retain and rebuild trust and online confidence in the news." While he says Singapore starts off from a relative position of strength, as local media enjoys significantly higher levels of trust than in many other developed countries, the gradual erosion of that trust is worrying. The Edelman Trust Barometer found that public confidence in business, media, government and non-governmental organisations in Singapore slipped last year. "Any time there is a decrease in trust, of course that is something of a concern," says Dr Janil. A challenge for mainstream media, he adds, will be to create products that are engaging for digital natives. "How can you think about writing and structuring your product in a way that is engaging and relevant to someone who has grown up consuming online?" Part of this effort of maintaining public trust and confidence - not just in the news but also in the Government and its institutions - means taking firm action when misinformation is being spread, he says. Nowhere was this more evident than in that now famous grilling of Dr Thum by Law and Home Affairs Minister K. Shanmugam. The intense questioning of Dr Thum was necessary, Dr Janil says. In his written submission, Dr Thum had accused the People's Action Party (PAP) of using fake news to detain more than 100 leftists in the 1963 Operation Coldstore. The Government has maintained that it was carried out for national security reasons. These submissions become part of parliamentary record and can then be protected by parliamentary privilege, Dr Janil notes. "So when you have people who come forward not in good faith, trying to exploit the process for their own agenda, that is when a certain approach was taken," he says. "We really had to defend the institution of Parliament and defend, in a way, the dignity of the process." Dr Janil's personal view of Operation Coldstore itself has been of particular interest to some, as his father, former trade union leader Dominic Puthucheary, was one of those detained and later exiled to Malaysia. His ban on entering Singapore was lifted in 1990. When The Straits Times raises the issue, Dr Janil makes it clear: "I am quite comfortable talking about it but I don't see that it is in any way relevant. "The people that I meet on a daily basis, the hundreds, if not thousands, of my constituents are not in the least bit interested. Yes, there is online commentary, very little of which you can verify represents the average Singaporean or even if they are indeed Singaporean accounts." Pressed further to elaborate, Dr Janil says he believes there were national security reasons for the Coldstore arrests and detentions. "I think that is a reasonable conclusion to come to, that there were indeed national security considerations," he says. Dr Janil was also one of two fourth-generation (4G) leaders - the other is Minister for Social and Family Development Desmond Lee - who penned a robust rebuttal to a commentary on the hearing by The Straits Times' editor-at-large Han Fook Kwang. Mr Han had written that the PAP's 4G leaders, "caught between the old world where the politics was unforgiving and the new world with different ideas about authority and leadership", should not aim to "win every argument". Dr Janil says he disagrees with Mr Han on two points. First, it is important to uphold Singapore's reputation as a place where "we don't let things slide". He adds: "It is like littering. You want us to close our eyes on littering?" And so it was important, for example, to question Dr Thum for as long as it took - in this case, six hours - to get him to concede certain facts about how "his work was suboptimal", he says. Second, he disagrees that the younger generation is uncomfortable with the Government's style of leadership. He returns to the theme of how his personal experience belies the chatter in some quarters. "How do you know they are uncomfortable? When I speak to young people, they are more than willing to challenge my views. "I find this idea that the youth of Singapore are apathetic or disengaged or not willing to speak up to be entirely incorrect."